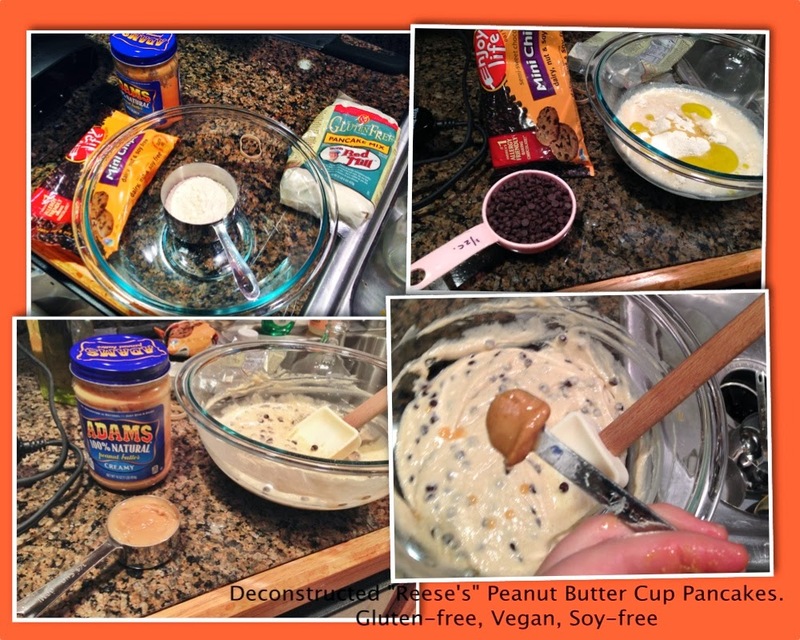 Green Vegan Living: Deconstructed "Reese's" Peanut Butter Cup Pancakes. Vegan and Gluten-free. Deconstructed "Reese's" Peanut Butter Cup Pancakes. Vegan and Gluten-free. His awesome grinning pumpkin is on the left, mine is on the right. And this morning for breakfast, I made us some "deconstructed" peanut butter cup pancakes. They are not, of course, made with Reese's because well, let's face it, most of the popular halloween candy on the market today is extremely disgusting and made with really nasty ingredients (and not at all vegan- or allergy-friendly). So I chose to make a deconstructed version of the candy I used to enjoy as a child. I started with Bob's Red Mill gluten-free pancake mix and added in some Ener-G egg replacer. I poured in rice milk and olive oil, then finished up the pancakes with Enjoy Life chocolate chips and Adam's natural peanut butter. The result was a very delicious, very filling pancake that was stuffed (literally) with peanut butter and chocolate. They are awesome. Deconstructed "Reese's" Peanut Butter Cup Pancakes. Mix together the first four ingredients in a large bowl. Scoop out peanut butter in tablespoon increments and mix in. Pour four portions onto a pre-heated griddle and cook until brown on one side, then flip and cook the other side until brown. Serve immediately. I've shared this on Allergy-Free Wednesdays.